For the 2016 – 2017 tax code, click here! As we know that the tax free personal allowance for this coming tax year 2015 – 2016, which starts on April 6th, will be £10600.00, the new tax code will be 1060L. This means you can earn £10600.00 before having to pay tax. HMRC will be issuing letters to PAYE taxpayers showing their new code over the next few weeks. Make sure yours is correct! HMRC have a tendency to change codes to reflect any changes in your circumstances from almost 2 years ago! If you submit (or we do it for you) a self-assessment tax return and get a tax rebate because you had certain expenses, HMRC assume that these expenses will be the same every year. We all know that is never the case! Conversely, if you perhaps had paid too little tax and had a code to correct that, make sure you’re not paying too much tax now. 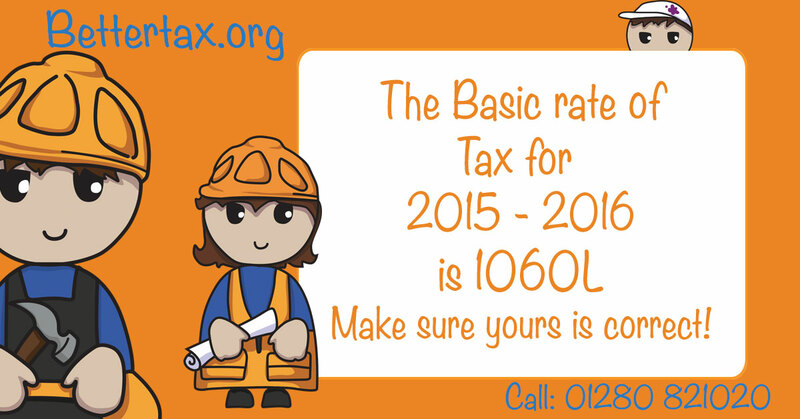 As a client of Bettertax, we can get your code changed to what it should be, 1060L. However, even as your tax agent, HMRC DO NOT tell us when they apply a different code, so please just keep an eye on yours and tell us straight away if it changes. You’ll find your code on your payslip, P60, letter or P45. We can always help find it with you.